1. 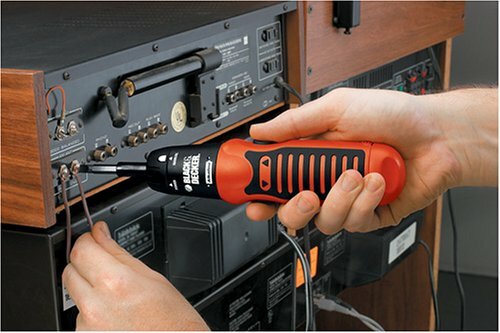 Unlike most Black & Decker electric screwdrivers, this uses four standard AA batteries. This means that you don't have to worry about using B&D re-chargeables that are always dead when you need them. I load mine with Eneloop low-discharge rechargeable AA's, which retain their charge for up to a year. When they go dead, I just replace them with another set and I can continue using it. 2. It is smaller than other B&D electric screwdrivers. 3. It has a manual mode that allows you to use it as a regular screwdriver. 4. You can switch the bit from flathead to phillips. You can get this one from Wal*Mart for $8.90 only. It's doesn't have strong torque but sufficient for light household tasks. I like this one instead of other cordless screwdriver because I can use my re-chargeable AA batteries. I hate those costly proprietary re-chargeable batteries. For $8.90, I am really happy with this purchase. Where is the storage for bits? This is a nice electrical screwdriver. I like the manual mode, in case I need to exert more torque than the motor can drive. The RPM speed is a little slower than I expected. 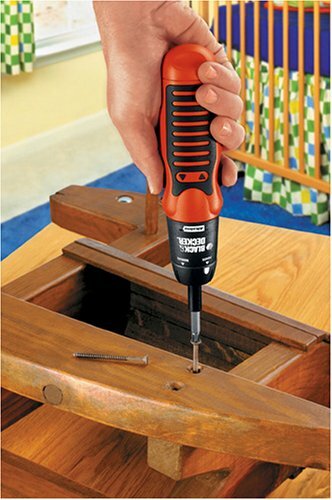 The only shortcoming for this screw driver is lack of the storage for the various screw bits. It shouldn't be that hard to add a small hook of some sorts to attach the various bits so the bits don't get lost when you need them. Saves loads of time ! For many years I have resisted a cordless, and after buying and using this screw driver I am sorry I waited so long. In a current project it has saved me loads of time and wrist turning. I saw it at Target, packaged as AS603 but when I brought it home and looked at the instructions it was the AS 600. One of the best $10.50 tools I ever bought!! It does what it claims to, but could be more powerful and maneuverable. No regrets on the purchase, but I'm sure there are better options. Let me start off saying that I've owned and used several power drills and screwdrivers in the past, both AC and DC powered. There is no question that AC powered devices last longer and in most cases is more powerful. But you can't expect to find an electrical outlet handy everywhere you might need it, so that's where the cordless/battery powered tools come in handy. In portable applications, rechargeable batteries probably makes the most sense than using disposable batteries because of the economical burden on those that would use these tools everyday. But rechargeable batteries eventual do die (i.e. no longer hold a charge) and would need replacing. Most battery powered high-end tools (e.g. drills, saws, sanders, etc.) usually are designed with replaceable rechargeable batteries. But here's the problem, most of the cordless screwdrivers have internal rechargeable batteries. What happens when these rechargeable batteries go bad? If you use frequently, it may last only a few months - then what? Throw it away? Send it to the manufacturer for battery replacement and end up paying more that what you original paid for the product? 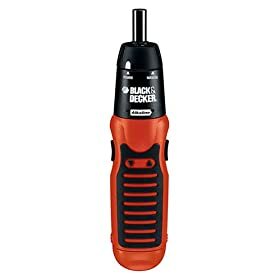 With this said and finally saying something about the Black&Decker AS600 itself, I bought mine at Target for about $10 and it really does get the job done. There is only one speed, but who cares - it's a screwdriver not a drill. Some of the reviewers mentioned that it has low torque - but I find the torque to be sufficient in most situations. It might get you trying to screw through unpiloted wood or metal. Fortunately for me, my applications already has existing threads. TIP: when unscrewing, put it to MANUAL and use your own elbow grease to get it started and then put it back to POWER and let the driver do the rest. Same thing when screwing - when the AS600 eventually stops put it MANUAL and tighten it the way you want. You know how most screws get stripped - when it gets screwed on by a power drill at the highest torque setting - almost impossible to unscrew. I've found that for some reason the reverse button is harder to press then the forward button. Although the instructions seems to insinuate that putting the device in MANUAL will turn off the device. Well, it definitely stops it from going forward or backwards but it's still powered on - i.e. there's no actual OFF switch. That's why when it's not in use, I take the batteries out and keep them in a plastic ziploc bag. Overall the AS600 is very convenient for me, it's not too heavy so I keep it in my work bag and is ready all the time - no charging and no waiting, just add in the batteries. That's enough said, thanks for reading my review. Looks very nice but reverse hardly works at all. I purhcased this item from a local hardware store here in NJ in Dec. 2008. The forward works okay but don`t try to use the reverse it hardly works at all. I tired to return it but since it was used the manager said no. I needed the reverse to remove a lot of screws from my old apartment`s walls prior to moving. I ended up going to K mart at the last second and buying a very cheap power screw driver that works much better. Now I can just add a cotton ball to the tip of this one and use it to remove ear wax! All joking aside, the item LOOKS very nice but failed to perform the ONE function I needed it for. Not nearly enough torque. The manual mode option is just silly. Get the Black & Decker LI3000 3.6-Volt Lithium-Ion Cordless Screwdriver instead. I bought this product because I don't like rechargeables. With this once the batteries deplete, just replace and back to work without waiting for a recharge cycle. I really like that it takes standard batteries. I'm so tired of NiCad batteries being unreliable and taking so long to charge. Not to mention losing the charger or not being able to buy replacement batteries when they burn out. None of these is a worry with this screwdriver. 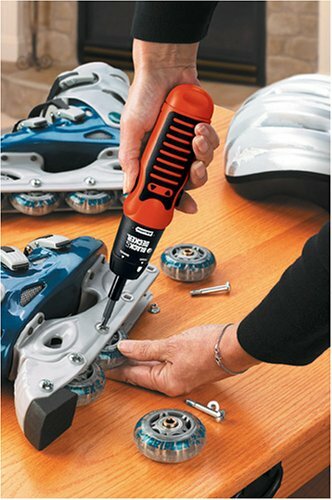 Has enough torque to get the job done for most situations and when the motor won't turn the fastener, just flip the lock to manual and use it like a standard screwdriver. Stay away from the AD600, though. Very useful for light work. I like how the switches are positioned and in seems to be running a long time on the first set of batteries. This is a totally acceptable screwdriver for the price. The power is decent, and it feels reasonably solid, if just the tiniest bit wobbly. The bit included is phillips on one side and flathead on the other. The grip is rubber and feels secure in your hand. The screwdriver includes four double A batteries -- so there's no need to rush out right away and buy them. This is a totally acceptable screwdriver for the price. The power is not great -- I was putting up some shelves and couldn't get screws into the wooden studs at all. I had to put it in manual mode. Manual mode is pretty good -- it feels reasonably solid, if just the tiniest bit wobbly. The bit included (phillips on one side and flathead on the other) is easy to use. The grip is rubber and feels secure in your hand. The screwdriver includes four double A batteries -- so there's no need to rush out right away and buy them. Overall, I would say spend a little more money and get something with more torque. But if you need something cheap for light chores, this will suffice. I was a little disappointed with the product because I thought it would have more power. I tried using it a couple of times, but the drill bit just spun without tightening the screw. It required A LOT of pressure to get the screw to move, and I could have put that much pressure into it and done it myself. This is quite a powerful cordless screwdriver, not the strongest on the market, but it is a lot more efficient than working with a manual screwdriver until your hands are blistered. Probably not powerful enough for professional use, but every kitchen drawer should have one. Puts the "power" into "girl power"